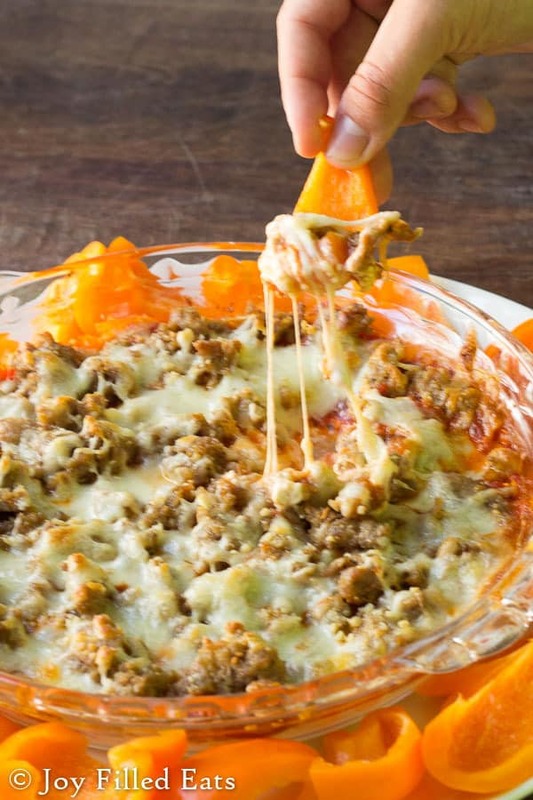 This Sausage Pizza Dip will be your favorite party dip. 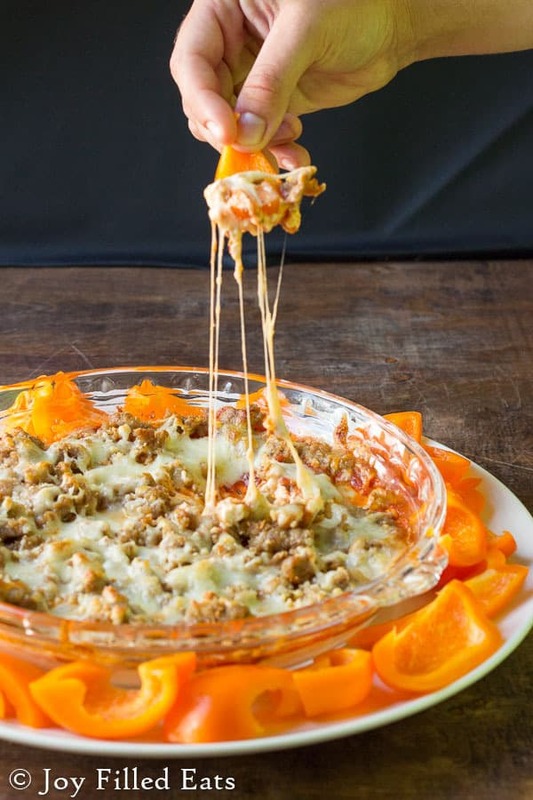 It has all the flavors of the best sausage pizza in an easy and healthy dip that pairs perfectly with fresh veggies. Oh, how I love pizza dip. My friend Jaclyn makes it for all of her parties and she was the one who gave me the first recipe I used. It is so easy. I’ve made it dozens of time over the last 7 or 8 years. A block of cream cheese, tomato sauce, mozzarella. Three ingredients. Done. I make it that way a lot of the time and if you are pinched for time or are a vegetarian you can make this that way too. 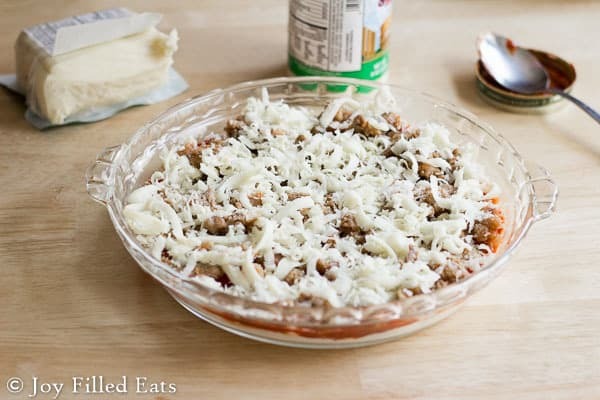 However, I decided to kick it up a notch and add crumbled sausage because that is one of my favorite pizza toppings. The other is mushrooms. It has to be crumbled sausage, not sliced. And the mushrooms have to be fresh, not canned. Either or on a traditional piece of pizza and I’m in heaven. 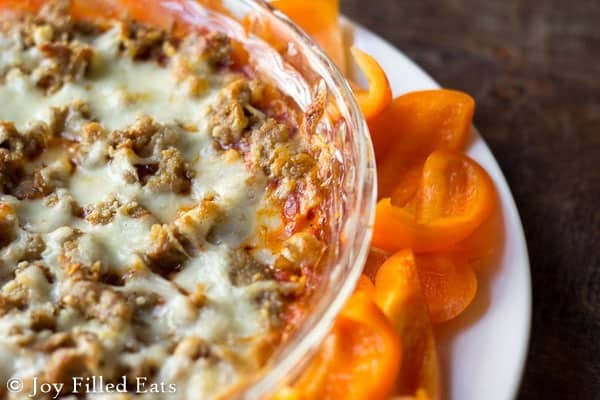 I’ve been known to make a smaller batch of this sausage pizza dip and just eat it for lunch with fresh veggies. 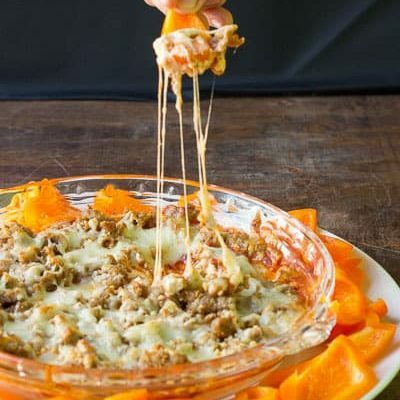 I like this sausage pizza dip best with sweet peppers or thinly sliced raw zucchini. I never realized how much I like raw zucchini until a few years when I got a spiralizer and began making zoodle salad. Raw zucchini has so much crunch and nice, mild flavor that pairs well with so many other tastes. Note: If you need to cook sausage for this recipe do that first. 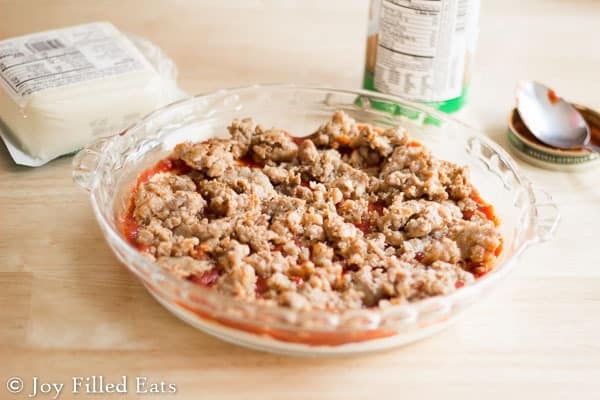 I like to cook and crumble a big batch and freeze it in 1 cup portions for recipes. First, I cut the casings off with scissors (so much easier than trying to squish out the meat), put them in a big frying pan coated with cooking spray, and just cook until brown. I break up the pieces with a potato masher a few times while it cooks. Spread the cream cheese in the bottom of a deep dish pie plate. Spread the tomato sauce on top. Top with the cooked sausage. Sprinkle with the mozzarella and parmesan. Bake for 15 minutes until bubbly and golden brown around the edges. If you need to cook sausage for this recipe do that first. I like to cook and crumble a big batch and freeze it in 1 cup portions for recipes. I cut the casings off with scissors (so much easier than trying to squish out the meat), put them in a big frying pan coated with cooking spray, and just cook until brown. I break up the pieces with a potato masher a few times while it cooks. Pretty much using peppers for all dips now! Delish! We love zoodles too, so I'll have to do a mix of peppers and zucchini next time. This is a really great dip! Love using the peppers to keep things low carb! Love! We had friends over last night and I made this dip! It was such a hit and I loved how quickly it came together! This looks great. What a different spin on dips. This would go really well with the baked cheese crackers (Keto) that are so popular (although they can take a while to make). Thanks for sharing! This sounds wonderful. What kind of sausage do you use? Sweet Italian pork sausage. You could use chicken sausage if you prefer or a spicy sausage. I hardly ever cook so I was excited to find this simple-to-make recipe for a party I attended. There was about 15 ppl there at the time I arrived and in 20 minute the whole dish was gone! Unfortunately I did not have a chance to taste it, but everyone raved about it. Thank you for the recipe!! has anybody already figured the nutritional info? i need to enter it in my fitness pal. thanks. Just made this and put it on a bed of lettuce to make a Pizza Salad. It was delish! !